Many people will be familiar with the oft-quoted five stages of grief: denial, anger, bargaining, depression and acceptance. After my most recent research trip to the Middle East, I noticed a distinct feeling that as far as Syria is concerned, most actors are now in the final stage: an acceptance that the civil war has been lost and that the regime will survive. It is a sense that the Syrian war is effectively over bar the fighting. This conclusion may appear somewhat counterintuitive, to say the least, given Raqqa remains in the hands of Islamic State and Deir az-Zour is still in the earliest stages of being pried from its grip. But in some areas, de-escalation has given way to negotiations, while in Idlib, the presence of al Qaeda aligned Hayat Tahrir ash–Sham means the Assad regime can demonstrate that those regions which won't negotiate with Damascus will simply be classified as terrorist havens, and dealt with as such. Although the West has maintained its opposition to Assad, it is not as forceful as it once was. Washington’s UN ambassador Nikki Haley said ‘I think we’re not going to be satisfied until we see a solid and stable Syria, and that is not with Assad in place’, which is something less than strident opposition. French President Macron has certainly shifted Paris' tone about the short-term future for Assad. Perhaps more importantly the battlefield momentum has shifted decisively in Damascus’ favour, and it has been using the de-escalation zones as a way of freeing up manoeuvre troops for use elsewhere. 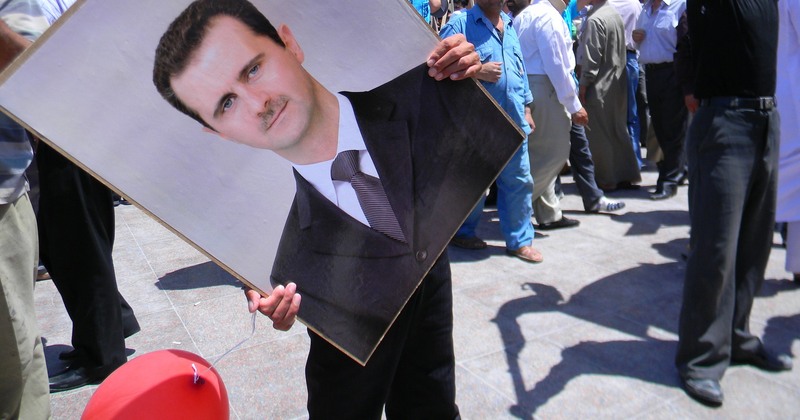 What concessions is Assad now willing to make to assure the long-term survival of his regime? On this there are two schools of thought. The first is that the regime will be expanded to accommodate at least some opposition groups previously opposed to Assad’s survival. Co-option makes sense because it shows external powers that six years of fighting has led to at least some political inclusiveness. It also allows those opposition leaders ‘inside the tent’ to maintain their supporters’ acquiescence by rewarding them with state-provided largesse. The second school of thought is that the regime, having fought for so long, is in no mood for compromise and wants to cow the opposition by adopting a ‘winner takes all’ mentality. Those who stood by the regime will be rewarded, while the reward for those who opposed it will be their lives and little else. Proponents of this line of thought agree that it is illogical to a Western mindset but perfectly rational to the regime. Assad and his allies are happy to continue to participate in UN-sponsored Geneva talks while negotiating local de-escalation zones with an intent to turn these arrangements into ceasefires followed by reconciliation on favourable terms. By doing so the regime incrementally creates facts on the ground that no amount of international negotiating is going to change. Members of opposition armed groups which have reconciled with the regime now fear they will be conscripted into the very army they fought. These concerns have been assuaged in some cases by Damascus allowing them to serve in the local, non-deployable government militia (the NDF) and have this count for their service. In some cases former combatants from anti-Assad groups which also fought Islamic State are being encouraged to join the Syrian Army’s V Corps to fight against Islamic State and have this service recognised. And while this has had little success to date, it may become a more attractive proposition in the near future as anti-Islamic State groups look for ways out of the morass. The Syrian opposition groups I spoke to still have forlorn hope that something may be salvaged from Idlib. Exactly what that is was never clearly enunciated – perhaps as an outrider post-resolution, or even as a model for future phases of the fight when the current phase oncludes. But there was not much substance to these musings nor confidence that it would occur. And with reports of ongoing airstrikes in Idlib, as well as the strength of the Islamist Hayat Tahrir ash–Sham there, it appears Idlib's chances of being an example of viable alternative governance for the rest of Syria are not high. Assad has vowed to re-take every last inch of Syria and while it appears he can’t generate sufficient combat power to do so, the de-escalation zones provide a degree of normalcy that he hopes will allow him to use to re-assert Baathist rule piece-by-piece. A population tired of war welcomes normalcy and local ceasefire arrangements achieve that. Damascus also hopes that the fractured opposition groups' poor access to resources means they will have to levy or extort it from the local population, thereby making the regime the lesser of two evils and more easily able to reassert control when circumstances permit. In the south, Jordan is keen to re-establish commercial links that transit through Syria and rid itself of its Syrian refugee burden. It also has much more control over the southern rebel groups, though Israeli concerns about pro-Iranian groups encroaching on the border means there is unlikely to be a lasting arrangement in the south. And in the northeast, the Syrian foreign minister has raised publicly the possibility of some sort of accommodation with the Kurds, while a senior Kurdish general in a recent interview acknowledged that the regime is here to stay. One can now envisage a situation where the regime rules over a country in which Islamic State is defeated and within which several non-government groups hold sway in certain areas, each with differing relationships with Damascus. Assad has played a long game, and he understands that ultimately a series of local agreements with opposition groups (rather than a single national agreement) favours the regime in the long run. Groups can be co-opted, allowed to wither on the vine, or suppressed when time and resources permit. And while this will take time and resources to pull off, there is the sense that people are now at the acceptance stage, even if events on the ground haven’t quite got there yet. Photo by Flickr user Beshr Abdulhadi. The Trump administration’s backward-looking and isolationist stance is the opposite of what's needed by the industries of the future.